warning: Parameter 1 to theme_field() expected to be a reference, value given in /home/dhorn/bazarrabusa.info/includes/theme.inc on line 170. Timothy Bazarrabusa's personal history is intimately tied to both the history of the Rwenzori region and the story of the British presence in Uganda. Born near the fabled Mountains of the Moon, Bazarrabusa was a member of the Bakonzo ethnic group that lays ancestral claim to the Rwenzori — though he did not speak the language and was not of mountain-dwelling stock. Bazarrabusa's father Paulo Byabasakuzi — who belonged to the Banyakyango sub-group of the Bakonzo — reportedly traced his origins to the Banande of eastern Congo. Around 1891, when Captain Frederick Lugard of the Imperial British East Africa Company passed through, the young Byabasakuzi was captured at his family home near Katwe (a center of salt production and trade, by the shores of Lake Edward). He was taken into slavery for several years before being exposed to Christian teachings (through the activity of the Anglican Church Missionary Society) and gaining his freedom. Baptized and confirmed in 1900, Byabasakuzi became one of the pioneering Anglican catechists in the Toro kingdom (he was licensed in 1901). He and his wife Sofu Kihangwa (who was licensed as a catechist in 1903) served as prominent Christian teachers in Toro for well over half a century. Byabasakuzi worked throughout western Uganda (collaborating closely with the legendary "apostle to the pygmies," Apolo Kivebulaya) and traveled as far afield as Rwanda and Mboga (Congo). Education was Timothy Bazarrabusa's primary profession, and a lifelong passion. In a sense, it was a family tradition; his parents were both teachers, though they exercised in a purely ecclesiastical context. After earning a Diploma in Education at Makerere College in 1934, Bazarrabusa began his career as a teacher at his alma mater Nyakasura School, before serving as headmaster at Kabarole Primary School (1943-1946). He subsequently moved into administration as Assistant Schools Supervisor and Visiting Teacher (1947-1950), and finally Schools Supervisor in the Native Anglican Church for the Toro District (1951-1961). In this latter capacity, Bazarrabusa notably coordinated the opening of schools in areas inhabited by the Bakonzo and Baamba minorities whose educational needs had been sorely neglected by the local authorities. Bazarrabusa's experience and achievements in the field of education were acknowledged in various ways. His reputation as Schools Supervisor led Governor Sir Andrew Cohen to appoint him as a cross-bench member of the Uganda Legislative Council in 1954. In 1960, Britain rewarded his contributions to education by creating him Member of the Order of the British Empire (MBE). Finally, in 1962 Bazarrabusa was appointed Minister of Education for the Toro Kingdom — a position he occupied from January to October, before moving to London to take up his posting as High Commissioner. Timothy Bazarrabusa had the rare good fortune to be born into a literate family and to receive an adequate education. His background and training kindled in him a passion for language and for the written word. He became one of the inventors of written literature in Runyoro-Rutooro, distinguishing himself by a resolutely contemporary approach to vernacular writing. For he did not content himself with recounting folk tales or royal histories (as previous authors had done) but instead adopted narrative forms such as travel and detective fiction. Bazarrabusa's semi-literary activities began as early as the 1930s or 40s, as publisher of Ruwenzori Magazine (a cyclostyled newsmagazine in Runyoro-Rutooro). He appears to have produced his first book-length work in 1940 following a visit to Zanzibar; taking travel as its theme, Akaana Akatabunga likely draws its title from a Runyoro-Rutooro proverb that wryly states: "a child who does not travel thinks his mother is the best cook" ("Akaana akatabunga kagamba ngu nyinako nuwe acumba obunura"). Other early works include Ihanga Rukanga (1947) on citizenship, and Onyuunye Omale! (1957), describing salt production in Uganda. Bazarrabusa's best-known work dates from the 1960s. In novels such as Ha Munwa Gw'Ekituuro ("At the Point of Death," 1963) and Kalyaki na Marunga ("Kalyaki and Marunga," 1964), he depicted contemporary situations and borrowed from "Western" literary forms, often to address moral issues. For example, Kalyaki na Marunga is a tale of car theft; the thief, Kalyaki, is eventually redeemed when his fiancée Marunga encourages him to turn himself in. Other works are more philosophical; for instance, the title story in the collection Obu Ndikura Tindifa ("I Will Never Die," 1966) is a meditation on the inevitability of death. Timothy Bazarrabusa's leisure pursuits were not limited to the purely intellectual. He was a dedicated outdoorsman and was closely involved with the introduction of Outward Bound in Uganda. He was also a committed conservationist and served as a Trustee of the Uganda National Parks from 1956 (before serving as Chairman in 1961). Above all, Bazarrabusa loved mountains — and in particular the Rwenzori, under whose shadow he was born and raised. When he joined the Mountain Club of Uganda (MCU) in 1954, he became the pioneering Ugandan mountaineer in a community composed exclusively of expatriates. He rose to serve as President (1961-2) and Patron (1963-4) of the MCU, and in 1964 was accepted as the first African member of the preeminent mountaineering organization, the Alpine Club. From 1954 until his appointment in 1962 as High Commissioner in London, Bazarrabusa made ascents of the major Rwenzori peaks as well as Mount Elgon, the Bufumbira volcanoes and Kilimanjaro. In July 1960, Bazarrabusa became the first recorded Ugandan amateur to attain the summit of Margherita (which at 16,763 ft is the highest peak in the Rwenzori and one of the highest in Africa). Timothy Bazarrabusa was best known for his political career. In 1954, the progressive Governor Sir Andrew Cohen appointed Bazarrabusa to the newly-created cross-bench of the Uganda Legislative Council. Serving until 1961, Bazarrabusa was an active member of the Council, speaking frequently and participating in several committees. Probably his most important contribution during this period was his participation on the Constitutional Committee of 1959 (nicknamed the "Wild Committee" after its chairman, J. V. Wild). Appointed by Governor Sir Frederick Crawford, this group was asked to make recommendations regarding the form of direct common roll elections, and possibly of the legislature and the government. The Committee produced a landmark report containing proposals for a swift advance to self-government. Despite the Protectorate government's resistance to the document, it was increasingly clear that Uganda was on the road to self-rule. Bazarrabusa left the national legislature in 1961 and joined the Toro parliament (before joining the Toro Kingdom government the following January as Minister of Education). 1962 brought major changes in Uganda, with internal self-government in March and full independence in October. The first government of independent Uganda (led by Milton Obote, Bazarrabusa's Legislative Council and Wild Committee colleague) appointed Bazarrabusa as the nation's first High Commissioner in London. He represented Uganda on the international stage until his untimely death in 1966. Despite his national and international commitments, Bazarrabusa did not neglect local issues. From the mid-1950s, he became increasingly involved with Bakonzo political aspirations. They and their neighbors in the Rwenzori, the Baamba, had long suffered discrimination at the hands of the Batooro. 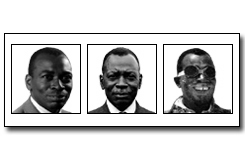 An early member of the "Bakonjo Life History Research Society" led by Isaya Mukirane, Bazarrabusa was among the first Bakonzo and Baamba representatives elected to the Toro Rukurato (parliament) in 1961. However, he had to distance himself from the increasingly radical faction — led by Mukirane — that would later evolve into the Rwenzururu secessionist movement. In February 1963, as mounting violence between Bakonzo and Batooro led the Uganda government to declare a state of emergency, Bazarrabusa was busy fulfilling his duties as High Commissioner. He was nonetheless instrumental in inviting Tom Stacey — a British friend of the Bakonzo — in an attempt to resolve the Rwenzururu crisis through mediation.